I recently read a brief report about the promotion of cycling in Malmö,Sweden, for which the city organized an advertising campaign. Part of the campaign involved a competition asking citizens to submit ideas that could help increase the number of bike users; resulting in the production of a book that engaged local celebrities to share their cycling stories as a source of inspiration to residents. The book contains a diverse mix of biking experiences, thoughts, stories, secrets, memories, commissioned essays and reflections; including a “rock star’s personal tour of the city, nostalgic biking memories, how biking satisfies a comedian’s need for speed and how cycling helped a local writer to become famous”. Now you’re probably wondering what this has to do with Pedestrian City, right? I’m hoping this will give you some ideas. I know some of you are having trouble getting started because you can’t decide on a place to focus on for the project. Instead of thinking of a place to explore first, try thinking of a story or memory and work from there. Start with a walking story, memory or reflection, answer the questions outlined in Task #1 (a few posts down), draw your map and wait for a day suitable for a winter walk with a camera. Another approach could be to use this as a visioning exercise, to share any ideas you might have to improve your neighbourhood of choice, no matter how idealistic they might seem! I’ve recently begun to read Rebecca Solnit’s Infinite City, a collection that maps the city of San Francisco based on a number of themes that have played a significant role in shaping the cultural and political movements that are synonymous with the city. Part geographical exploration, part cultural study, part history lesson, this unconventional atlas takes the reader through a journey of a multitude of experiences in and perceptions of the city. Through these meanderings, the reader is invited to wander/wonder about their own city, places they’ve lived, played, travelled. [A city has thousands of] inhabitants, more or less, and each of them possesses his or her own map of the place, a world of amities, amours, transit routes, resources, and perils, radiating out from home. [A city contains thousands of] living maps, because each [citizen] contains multiple maps: areas of knowledge, rumours, fears, friendships, remembered histories and facts, alternate versions, desires, the maps of everyday activity versus the map of occasional discovery, the past versus the present, the map of this place in relation to others that could be confined to a few neighbourhoods or could include multiple continents of ancestral origin, immigration routes and lost homelands, social ties, or cultural work. [No] two people live in the same city. Your current surroundings exist in relation to your other places, your formative place and whatever place shaped your ethnic heritage and education, in relation to your role in this current place… If you pay attention to the neighbours, you find other worlds within them, and other neighbourhoods magnify this effect. Most of us settle into familiar routines in which we see the same places and people…in the city, but it takes very little…to land in some unfamiliar city, to find that the place is inexhaustible. There’s been a lot of talk lately about Urban Interventions – the Vancouver Design Nerds are planning a Nerd Jam on this topic in a couple of weeks! There’s also an idea or two up my sleeve that I want to propose for collaboration between the Nerds, the Vancouver Public Space Network and Pedestrian City. What are urban interventions? They are a form of art that ranges from small, almost imperceptible transformations to large scale installations that temporarily alter a streetscape or public space. Whether done in celebration, protest or critique, urban interventions present an opportunity to change a space, make a statement, and indirectly engage passersby to reconsider how we use public space and move through our neighbourhoods and cities. The whimsical and unexpected can encourage social interactions between strangers, or simply bring a smile to someone’s face! At the very least these interventions should make you consider the simpler things you may overlook regularly, awakening your perception and curiosity about the smaller details of your everyday experience. And sometimes these things are purely coincidental! I came across an old project the other day – a documentation of my thought processes and the texts that led to the creation of Pedestrian City. What began as an exploration of Guy Debord’s The Society of the Spectacle and a desire to illustrate a select number of theses became a series of reflections and quotes about urban life, with several of the theses and a small collection of photos interspersed throughout. There is a heightened sense of time when one is walking (or using other forms of active transportation), where things must be planned and scheduled in advance, and about the sense of place that can only be experienced on foot. Many people live in a series of interiors (fragments) – home, car, gym, office, shops – disconnected from each other, moving between spaces in cars. Walking enables everything to stay connected, for while walking one occupies the spaces between those interiors in the same way one occupies those interiors. While walking, one lives in the whole world rather than in interiors built up against it. Car dependency and gentrification threaten to disperse established urban populations and/or disrupt social networks. What is needed are efforts to reinstate a sense of community building and local social networks; decrease reliance on the automobile and make the city more walkable. The city should be a place of unmediated encounters, not large suburbs – segregated and designed for the non-interactions of motorists moving between private places rather than the interaction of pedestrians in public ones. If the social, political and infrastructural networks that promote active transportation are in place, public spaces will occur organically as people begin to take pleasure in the small details of the city and the spaces in-between buildings. Photography is more than a means of exploration and documentation; it is a representation of something that is always already seen, a representation that makes one question the significance of an image, what it signifies, and why the photographer chooses to produce pictures that say something about the social world. The photographer can be imagined as a wanderer, wandering purposefully like a hunter-gatherer with the camera a sort of basket laden with the day’s spectacles, the photographer gathers the fruits of those walks, the fruits of their psychogeographical wanderings. 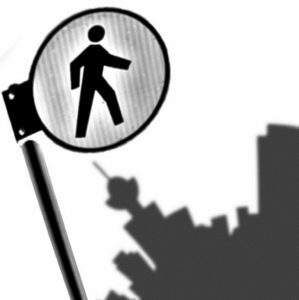 Today I remembered how Pedestrian City began; who and what inspired the project. There are the obvious catalysts, Jane Jacobs, and Guy Debord and the Situationist International – Jacobs was an advocate for dense, active mixed-use neighbourhoods made for walking and socializing, and encouraged walking as a means of getting to know your neighbourhood; while Debord gave me a new way to explore with his concepts of psychogeography and the derive. The less apparent, but probably first inspiration was Gaston Bachelard and his book, The Poetics of Space, which I am re-reading for at least the fifth time. I like to think I dream differently when I read this book. At least I think about and experience spaces differently, more consciously and reverently. In The Poetics of Space Bachelard explores lived-space as it relates to our daily experiences, reveries and reactions, with the earliest impressions, those formed in childhood, being the basis for how we experience space throughout the rest of our lives. It was this that I remembered while walking to Queen Elizabeth Park today, with the book in my bag and a camera in hand.